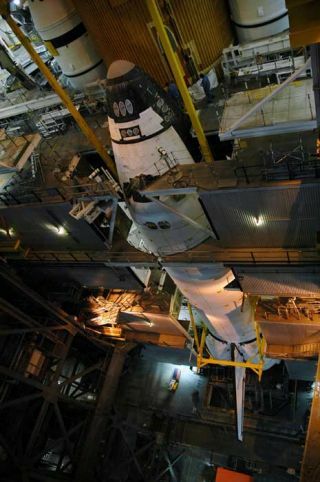 In the Vehicle Assembly Building, the orbiter Atlantis has been lowered onto the mobile launcher platform where it will be joined to the external tank and solid rocket boosters already in place for NASA's STS-115 mission to fly in August 2006. CAPE CANAVERAL - NASA hasmoved up the launch window for shuttleAtlantis by one day. Shuttle managers decidedThursday they will have enough light to get good pictures of Atlantis and itsexternal tank if the launch happens Aug. 27 instead of Aug. 28, a possibilitythe agency had been studying for several weeks. The launch window for Atlantisnow runs from Aug. 27 through Sept. 13, although NASA and the Russians haveagreed the shuttle probably would notlaunch after Sept. 7 to avoid a potential conflict with another visitingspacecraft. A Russian Soyuz is set todeliver the next permanent crew to the International SpaceStation in mid-September. A shuttle launch too late during the existingAtlantis window could result in both spaceships being docked at the orbitingoutpost at the same time, a violation of flight rules. In addition to theoversized crew that would result from both ships being there at once, the spacestation partners prefer several days cushion between visiting ships to give thepermanent outpost crew time to rest and get ready. The Aug. 27 opening of thewindow remains a target only. An official launch date will be set at a FlightReadiness Review meeting next month. Meanwhile, Atlantis is set to rollto the launch pad early Monday morning.